Thanks to the establishment of Dark Fire Press (darkfirepress.com), Gentleman Cthulhu comics are now available on ComiXology.com. 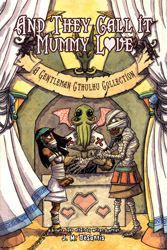 As of today, they’ve also added the long-awaited And They Call it Mummy Love collection to the site! You can find all three current collections listed here: comixology.com/Gentleman-Cthulhu-Emeritus-Moribus-Monstrum/comics-series/128431. Also, an IndyPlanet print version of the Mummy collection should be available soon. While I know the present web-comic is very far behind, creating Dark Fire Press is allowing me to expand my reach with certain projects such as Gentleman Cthulhu. I’m planning to start posting new and back comics again soon, as I have all the intention in the world of continuing the web-comic for the foreseeable future. I just needed a break from both this and Chadhiyana (my other comic) to explore some new projects. That said, and since I’m sure most visitors to this site are fans of H. P. Lovecraft’s work, I’d like you to take a look at my two upcoming projects: Robert Phillips (novella) and The Tainted Ones (one-shot comic). Both are listed on darkfirepress.com and are Lovecraftian in nature. Once those two books are complete, I should have more time to return to Gentleman Cthulhu once more and get caught up. Also, if you like my work in general, there’s also my book J. M. DeSantis: The First Ten Years, which features a collection of my writing and artwork from the beginning of my career. It includes a section on Gentleman Cthulhu and other Lovecraft-related work, comics and artwork alike. Well, that’s about all for now. I’ll return again soon.